Aladdin (Tubagus Indra) is a 10 year old honest and clever boy. He has been chosen to take the magic lamp from a cave. Lahab (Chairul Yusuf) is someone who has been waiting thousand of years for the birth of Aladdin because he wants to take the lamp from Aladdin and then take control of the world. After a thousand years, Lahab finally finds Aladdin and takes him to the cave. Aladdin rubs the lamp and out comes a Genie (Daus Mini) who bows down to Aladdin. This upsets Lahab. He chases Aladdin to get the lamp that he has been waiting a thousand years for. 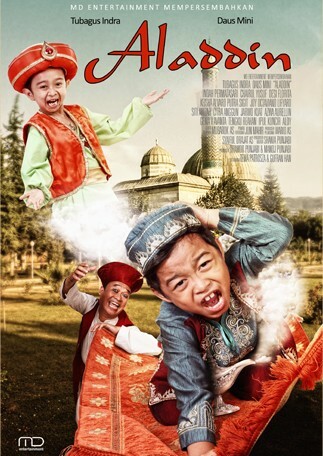 Apart from Lahab, Aladdin is also chased by Abu Jahil (Keisha Alvaro Putra Sigit) his school friend who competes with him for Yasmin's attention. Lahab's attempts at stealing the lamp and Abu Jahil's tricks on Aladdin are always prevented by the genie. Aladdin then becomes a hero for helping out people in trouble with the genie's help. In every episode Aladdin takes care of every problem caused by Lahab and Abu.